Are You Killing the Catbird Family? "A sad story from the North Country Wild Care Hotline.....We received a call about some baby birds on the ground (we get alot of them this time of year) but what was different about this one was that when we got there, we found 3 dead babies and the parent were also dead, all within a few feet of each other, near their nest. We questioned the finders, are there any cats? Did they see any other predators? And finally, had they put any chemicals on their lawn? The finders answered 'no' to all of the above - however, their neighbor had just done some extensive landscaping and had put alot of chemicals down (weed killer, grub killer, etc). It is nice to have a green lawn but please think about what you are using and be sure it will not cause collateral damage. Apparently the parents had fed their young some of the poisoned insects and then ingested some themselves - a beautiful family of catbirds died as a result of this incident. Personally, I would rather deal with some weeds and grubs." A zen principle I embrace and attempt to weave through the posts I present on The Zen Birdfeeder is "Zen RESPONSIBILITY". 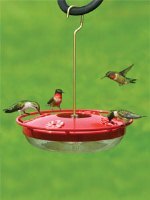 I espouse that "Birdfeeding comes with responsibilities to the birds and the environment we share with them." We are content to live our lives in silos, but unfortunately the world doesn't exist in silos. The decisions we make about the chemicals we use, the trees we cut, the coffee we drink, the purchases we make, the companies we support...I could go on and on...can impact the environment we share with the birds and other wildlife. We love "our" birds...but we want weed-free, green lawns. So we coat our yards with chemicals to kill the weeds, green the lawn, and eliminate the insects. But we never stop to think that when we put poisons on the yard and the bugs, we poison the animals that forage in the yard and eat the bugs. We're poisoning our birds. We take the word of the lawn care "professional" that the poisons they apply will not affect wildlife or other animals that pass through the yard. But think about this: The Gray Catbird diet is primarily insects; how long can we expect birds that weigh only 2-ounces and their even smaller babies to live after eating meal after meal of poison-coated insects? We make choices every day that impact the birds and our environment. And with information so readily available to us today, we cannot claim ignorance of the pros and cons of the alternatives before us. I have chosen, and will continue to choose, to live with the birds in a chemical-free yard. I'll deal with the weeds; the birds will help us deal with the insects. All of us continue to be concerned about the environmental impacts and affected wildlife following the oil spill in the Gulf of Mexico. And in June, our customers pulled together to support one of the leading organizations working to rescue oil coated birds in the gulf. Through a donation box on our front counter and a garage sale held in-store, we were able to collect and send, with our own contribution, $500 to the International Bird Rescue Research Center to support their efforts around the globe. We always knew our customers were the best out there, but this outpouring of support for the IBRRC warmed our hearts. Thank you to the great customers of Wild Birds Unlimited - Saratoga Springs NY for your generosity and concern for the birds. Ithaca, NY— A simple lifestyle choice can have a positive impact on bird conservation around the world. Scientists have established that the traditional method of growing coffee—beneath the canopy of a forest, rather than chopping down the trees for sun-grown coffees—provides vital habitat for birds. Research has shown that traditional shade-grown coffee plantations in Mexico can support more than 100 bird species, compared with 6–12 species in sun-grown monocultures. Support of the shade-grown coffee movement has led to a new partnership between the Cornell Lab and Birds & Beans®, a Massachusetts-based retailer that specializes in shade-grown coffee products certified “Bird Friendly®” by the Smithsonian Migratory Bird Center. This certification means that Birds & Beans coffee is 100%-organic and shade-grown. People who buy Birds & Beans Bird-Friendly coffee also help protect birds a second way: A portion of all online sales and sales of the coffee at Wild Birds Unlimited stores such as the Saratoga Springs NY shop goes to the Cornell Lab to help support its ongoing bird research, education, and conservation programs. Press Release and bird image provided by Cornell Lab of Ornithology. Are "Our" Birds Impacted by the Gulf Oil Spill? Sometimes it takes a major crisis like the oil spill catastrophe in the gulf to awaken us to the fact that we are all connected. Less than a month after President Obama gave the go-ahead to offshore drilling off the Atlantic, Gulf and Alaskan coastlines, a deep-water drilling platform called Deepwater Horizon, leased by British Petroleum (BP) exploded and burst into flames, billowing thick clouds of black acrid smoke. The platform then sank, and since then, oil has been leaking into the Gulf of Mexico. The spill now covers an area these size of state of Delaware. Follow this link to see a map of the day-by-day progression of the spill. BP - as well as other oil companies - and their PR teams had assured Americans that this type of catastrophe would not happen (does this sound familiar? Think Wall Street banks). And BP - as well as the other oil companies with deep-water platforms off American coasts - was not prepared for the extent of this catastrophe. So their response (it is THEIR responsibility, after all) has been ineffective, as the well continues, 14 days later, to spill oil into the waters of the gulf. The effect on the US and the world, let alone the gulf states, is immense. Local fisheries and tourism could be devastated. Thousands of wildlife (turtles, fish, birds, and more) could die or be weakened, all at the height of nesting season and migration. Future wildlife populations may also be impacted, depending on the species' reproductive rate and strategy. So as I look out on my yard this fine sunny spring day, how could this impact MY birds when I am thousands of miles from the spill? These birds' (plus hundreds of other species) migratory routes take them over or around the impacted gulf area. And since the spill and subsequent mitigation efforts negatively impact the water, the air, and the habitats surrounding the gulf, it could be tough for them to avoid the damage. Just because some individuals of these neotropical migrants have already arrived in our area (the first of my Rose-breasted Grosbeaks just arrived yesterday), that doesn't mean that all birds are done migrating. It is a good survival strategy for a species to spread out migration over a period of time so that a catastrophe doesn't wipe out the entire population. So millions of birds are still trying to make their migratory journey over or near the gulf. Critical "refueling" spots on these northward journeys may be tainted by the oil spill, leaving the birds weakened for the remainder of their journey. Then there's the impact on fall migration. Migratory songbirds that are safely in our yards now to breed could pass through these impacted areas come fall. Bird populations are at their highest in the fall, with adult birds as well as all the first-year birds making the journey to wintering grounds. Habitats along the gulf that typically provide vital food, water, and shelter during their southward migration could be in no condition to support the millions of birds that rely on them. Will their southward journey be successful? Will their winter habitats be able to support them? Only time will tell. Check out conservation sites like the American Bird Conservancy to see how you can help. Longer term, participating in citizen science projects like Project FeederWatch will help scientists see how this catastrophe has impacted bird populations. It's our Birds & Beans 1st Anniversary! One year ago, Wild Birds Unlimited - Saratoga Springs introduced to our customers Birds & Beans® certified Bird-Friendly™ coffee. We found out about Birds & Beans from the Smithsonian Migratory Bird Center (SMBC), which is behind the all-important Bird-Friendly certification. - January 2009 - Lois and I began our search for a shade-grown coffee to sell in store. We decided it was time to walk the talk by drinking and selling a coffee that was not destroying the habitat of the migratory birds we so enjoy. - Early February 2009 - Through SMBC, we are introduced to Bill Wilson of Birds & Beans coffee. Birds & Beans sells ONLY certified Bird-Friendly coffee, meaning, as Laura Erickson recently pointed out in a Facebook comment, that to her knowledge "Birds & Beans is the only coffee distributor that sells ONLY Bird Friendly coffee. And that means that they are the one coffee seller that doesn't make a profit off destroying tropical habitat." After tasting a sample of the Scarlet Tanager blend, we brought in our first order, which at that time, was only available in 2 pound bags. - March 2009 - WBU-Saratoga Springs became the first retailer in New York state to carry Birds & Beans coffee. 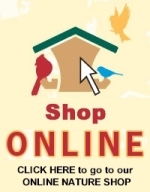 We were the first Wild Birds Unlimited store in the country to carry it. There are now a dozen WBU stores across the country selling it. Many customers take us up on our offer of a free 4-cup sample to try out. We started offering coffee to sample every weekend. - March 17, 2009 - "Why Shade-Grown Coffee Matters to Birds" post. You can almost FEEL the excitement amongst the birdwatching crowd. Spring is coming and along with it the birds that have been out of our area for what seems like an eternity. On listservs and blogs, and at Wild Birds Unlimited stores across the country, the stories of the return of our migratory birds are streaming in. In my area, Red-winged Blackbirds start the excitement, their arrival marking the true arrival of spring. The excitement is palpable. The anticipation grows. "When do the hummingbirds arrive?" "How about Rose-breasted Grosbeaks?" "When can I put out oriole feeders?" What if the answer to these questions is,"They're not coming back"? - March 27, 2009 - We welcomed nationally recognized naturalist, birder and author Kenn Kaufman to speak in Wilton on the subject of Bird-Friendly Coffee. 40 people got to hear him speak and answer questions. Kenn was awesome! - March 30, 2009 - Kenn honors us with his blog post, "Meeting Kindred Spirits over Coffee"
- June 6, 2009 - we introduced Adirondack birders to Birds & Beans at the Great Adirondack Birding Celebration at Paul Smiths. Bridget Stutchbury, a Birds & Beans Voice of the Birds, was keynote speaker. Her message included a very strong message in support of SMBC certified Bird-Friendly coffee. - June 10, 2009 - our "How to Know You're Getting REAL Shade-Grown Coffee" post. Have you ever bought a loaf of bread labeled "whole wheat" and found in looking further that whole wheat was way down the ingredient list? So how do we know what we're getting when we buy a bag of "shade grown" coffee? With no regulations for what can be labeled "shade grown", coffee companies and well-intentioned conservation organizations are at liberty to use the label on coffee that may have been grown in conditions that don't quite achieve the shade-grown goal of protecting the habitat of neotropical birds and other wildlife. - August 2009 - we introduced Birds & Beans coffee in a convenient 12 oz. size. - September 2009 - Our decision to carry Birds & Beans coffee was included in the article about our store in the trade magazine Birding Business. The article effectively introduced hundreds of other birdfeeding hobby shops to Birds & Beans coffee. - November 2009 - we introduced Birds & Beans in decaf. - March 2010 - One year later, we've sold nearly 200 bags of Birds & Beans Bird-Friendly Coffee. That's about a bag every other day. We serve Birds & Beans coffee every weekend to our customers. And we talk to everyone who tries it about what a difference a Bird-Friendly coffee can make in the lives of our migratory birds. On February 2nd 2009, in response to a request via the Smithsonian Migratory Bird Center, I wrote: “Dear Nancy, We would love to have you take our ‘Birds & Beans’® the good coffee”. Boy, have they ever done a terrific job for us – and the birds – over the year since then! We have gotten to know Nancy and Lois well, had a wonderful event with Kenn Kaufman, been introduced into the Wild Birds Unlimited world – and looking forward to many more years together. Always full of great ideas, Nancy and Lois are Birds & Beans and Bird Friendly® coffee's most supportive wholesale customer. They are fun to work with – and the deep commitment Wild Birds Unlimited - Saratoga Springs has to bird conservation is inspirational. Happy anniversary and thank you for a great year. Everyday, we look forward to being able to tell the Bird-Friendly story to people, whether at the store, on our blog, on Facebook or on Twitter. We believe that we can make a difference to our birds by sharing what we know. Please consider joining us by drinking only a certified Bird-Friendly coffee. We'd strongly recommend Birds & Beans brand. It's a wonderful-tasting coffee. On March 27th, we'll be participating in our second Earth Hour, joining millions of others around the globe by turning off our lights for one hour in the biggest climate action ever. Watch this very inspirational video then please JOIN US by turning off YOUR non-essential lighting on Saturday, March 27, from 8:30-9:30pm local time. Find out more and sign up at EarthHour.org. We're all thinking more about our own carbon footprint, doing things like changing to compact fluorescent bulbs, recycling paper and plastic, bringing our own bags to the grocery store and farmers markets, and more. These are all little things we've chosen to do to try to make a difference. Here's another easy and tasty behavior switch you can make: drink a certified shade-grown coffee. When you drink a shade-grown coffee, especially a certified Bird-Friendly® coffee, you contribute to the preservation of and return to traditional shade-grown coffee farms. When you drink a sun-grown coffee, you are (perhaps unknowingly) contributing to massive deforestation in coffee-growing regions. Deforestation represents about 15 percent of annual greenhouse gas emissions - more than all the world's cars, trucks, planes, trains, and ships combined. Tropical forests can recover up to 90 percent of their original biodiversity in as little as 20 years. Protecting and restoring forest is a much cheaper way to cut CO2 than even switching to renewable energy. $1 spent on forest measures buys as great a CO2 reduction as $6 invested in emerging technologies, such as solar power. Your conscious choice of a certified (preferably Smithsonian Migratory Bird Center certified Bird-Friendly®) shade-grown coffee sends a message that you care about deforestation and want to encourage a return to traditional shade-grown coffee growing methods. Look for this label on your coffee!